It played the festival circuit (Whistler Film Festival, Ocan Film Festival, etc.) during late 2017 and early 2018 and would have gone largely unnoticed if not for the stellar efforts and watchful eye of Indican Pictures. 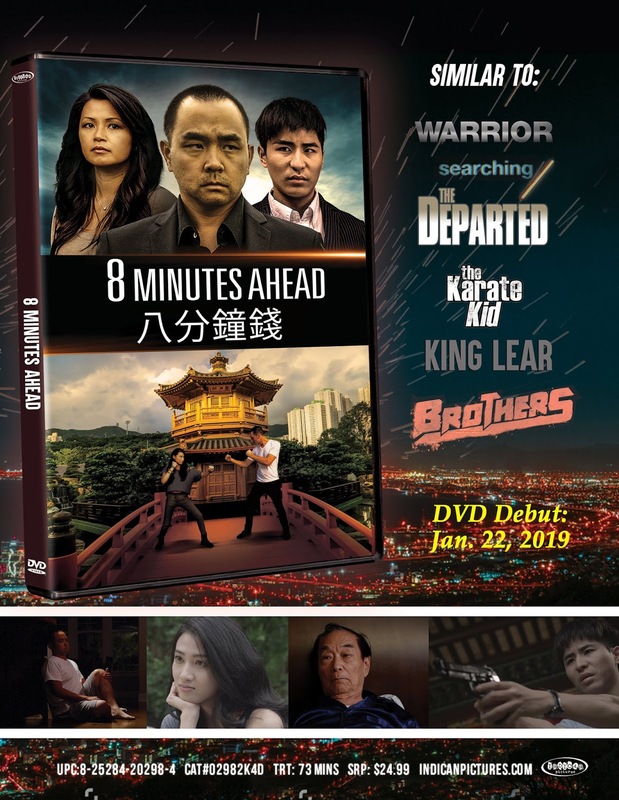 They will be bringing it to the domestic market on Jan. 22 with a DVD push. 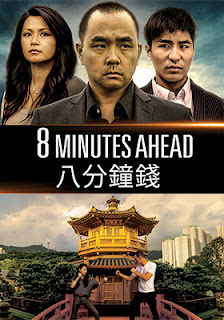 This technical expertise has paid off as 8 Minutes Ahead belies its indie production budget. You would never guess that it took four long years to get the project off the ground and completed. The strong storyline, coupled with the solid performances from a largely unknown cast and the crispness in its execution all combine to make this one of the New Year’s early must-see home entertainment entries. Danny (Raugi Yu) is a Hong Kong native who is now living in Canada. He’s the son of a wealthy shipping magnate named Zhou Li (played by Tseng Chang — Dim Sum Funeral, Shanghai Noon, Romeo Must Die, etc.) who has not long to live … and in these final days he decides to set one particular matter in his life right. 8 Minutes Ahead is presented in English and Mandarin (with English subtitles during these sequences). In other new-to-DVD release news from Indican Pictures this past week, director Cornelia Duryée’s (aka: Cornelia Moore) intense mystery/thriller, West of Redemption, will be making its debut on Jan. 29. This is one of those head-scratchers. 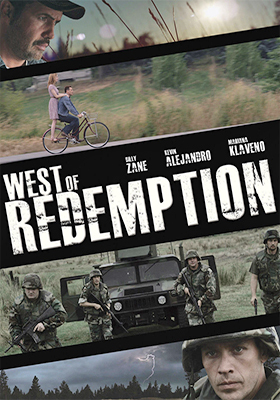 West of Redemption was produced back in 2015 and then proceeded to work the festival circuit throughout the balance of year, winning the Best Feature award at the Jefferson State FlixxFest and Best Dramatic Direction at Eugene Film Festival (among others) and then suddenly disappeared. Fortunately, Indican Pictures got wind of this indie gem and is now bringing it to the home entertainment marketplace. The story takes place in 1989, where we are introduced to Hank Keller (Billy Zane) and his much younger wife, Becky (Mariana Klaveno — best known to audiences as Lorena Krasiki of the True Blood television series), who live on a remote farm near the sleepy town of Redemption (filming took place in and around Spokane, Washington). A seemingly uneventful evening takes on ominous tones during a much needed rain shower when a knock on the door finds a young man (Kevin Alejandro — as Dan Espinoza in the Lucifer television series and Jesus Velasquez in the True Blood series), soaked and in need of a tow truck (he says). Hank lets him use the phone and then upon hearing him relay his name, “Richard Youngblood,” to the tow truck driver on the other end of the line he waits … he waits for the call to be finished and then beats him senseless with the phone. Filmmaker Cornelia Duryée’s West of Redemption ratchets up the tension, the suspense — and the mystery — to the point of intensity of which nightmares are made!! !